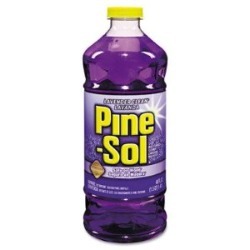 Jennifer provided a review of Pine Sol cleaner, in the lavender scent. I am reviewing Pine Sol Lavender Scent. It has a very good smell, which is cleaner and fresher than most cleaners. It works great on deep soiled areas, like in my kitchen and bathroom. In fact, I love to mop my kitchen floor with it. It leaves my house smelling so very fresh. I also clean most of the surfaces in my bathroom and kitchen with it. I like that it is an all purpose cleaner, and is concentrated. I can dilute some in a bucket, with water, and clean lots of the hard surfaces in my house, like my tile, linoleum, counter tops and sink. Whenever I want a job well down I reach under my cabinet and pull out my bottle of lavender Pine Sol, and just the aroma of it makes me say oh it smells so good! When I have visitors they always compliment the way my house smells. They say it smells like a field of fresh flowers. I would recommend for anyone to use this product. It does what it's guaranteed to do and leaves a great aroma throughout your home. Plus, Pine Sol Lavender scent is very inexpensive and convenient. It is found at most of your local retail stores. They provide many other scents if you are not happy with the lavender one. Lavender is personally my favorite just because it smells so fresh, so beautiful, and so clean. Thanks Jennifer for your review of Pine Sol, lavender scent. Does anyone else use Pine Sol, in any of the scents and want to share a review? If so, you can share your household cleaner reviews here of this, or any other product you like to clean your home. In addition, you can share your general purpose cleaner review here, if you've used a product that works well for you to clean many areas of your home, or read other reviews of brands that have already been submitted. I have been using this product for several months and it works great and smells even better...except the last two bottles I bought have a different scent. It seems as though there has been some change that has not been indicated on the bottle. Not happy! Bring back the original scent...it is way better.